Owl-o-ween Scissor Fob [H6305] - $11.98 : Yarn Tree, Your wholesale source for cross stitch supplies. 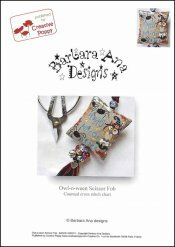 Cross stitch design by Barbara Ana Designs. A scissor fob like no other, and so much fun to stitch. An owl is standing on a cauldron of boiling green slim next to "Happy Owl-o-ween". Black spiders with red eyes, candy corn, and Quaker motifs border the design. Stitch count 73 x 80. Stitched on 28ct linen.